Specificity/Sensitivity: Does not cross react with other calcium binding proteins including calbindin, calretinin or parvalbumins. Specificity/Sensitivity: S100 belongs to the family of calcium binding proteins. S100A and S100B proteins are two members of the S100 family. S100A is composed of an alpha and a beta chain whereas S100B is composed of two beta chains. This antibody is specific against an epitope located on the beta-chain (i.e. in S-100A and S-100B) but not on the alpha-chain of S-100 (i.e. in S-100A and S100A0). 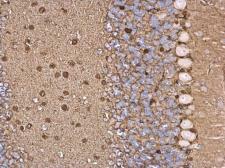 This antibody can be used to localize S-100A and S-100B in various tissue sections. S-100 protein has been found in normal melanocytes, Langerhans cells, histiocytes, chondrocytes, lipocytes, skeletal and cardiac muscle, Schwann cells, epithelial and myoepithelial cells of the breast, salivary and sweat glands, as well as in glial cells. Neoplasms derived from these cells also express S-100 protein, albeit non-uniformly. 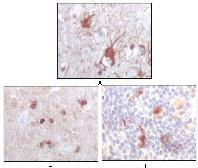 A large number of well-differentiated tumors of the salivary gland, adipose and cartilaginous tissue, and Schwann cell-derived tumors express S-100 protein. Almost all malignant melanomas and cases of histiocytosis X are positive for S-100 protein. 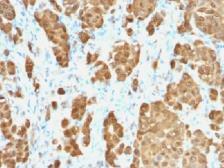 Specificity/Sensitivity: This antibody is specific for both S100 (beta-beta) and S100 (alpha-beta).